The greaser hair is from a time when looking good or keeping a beautiful mane was what defined a classy man. In the 1950’s it was all about style, but men were more conservative and would only go for hairdos that were simple but also elegant. The use of a generous amount of gel or pomade on any cut was found to be fashionable, and no look would be complete without this. Over the years, these designs have made a comeback, and the following 51 hairdos are examples of the favorite greaser styles that modern men wear. Tapering helps men avoid cutting their hairs very short on the sides or fading them if they do not like it. In this style a longer top is maintained then the sides tapered to create a receding hair length as you move from the top. Some pomade or gel is then used on the mane and it is combed up and backwards at the top. The sides are also combed back to create a gorgeous wavy and tapered haircut. The side roll is a modern variation of this classic hairdo and demonstrates the less conservative nature of the modern man and the changing tastes and preferences. In this cut the sides are given a beautiful fade and long hair is left in the top and middle section and goes all the way to the back. Some products are used in the longer hair and then it is given a fantastic side roll that also creates a single curl at the front. During his reign as the king or rock and roll, Elvis was also a fashion trendsetter especially when it came to the hair. However, his pompadour greaser haircut is his most famous hairstyle, and it is still being worn decades after his death. His rockabilly hairdo was created by leaving a longer top that was then flipped back to form an exaggerated look with the shorter sides also being pushed back. Just like most other styles in this era, a lot of gel or pomade was required. Looking at this mane, you would be tempted to think that the wearer intentionally made it into thin locks. But this actually the effect of the hair products used. Here a generous amount of gel is applied then the hair is pushed back to create beautiful bangs that flow to the back. To make the cut more interesting, two of the locks are brought forward over the face. Side parts can be found in many modern styles, and so it is only fair to have a variation of the greaser with a part. This style keeps the high top and short sides but the maintaining it what makes it fabulous. The introduction of the side part makes all the difference with the extended crown being back and side swept. Shorter hairs below the side part are then also slicked. The scissor trimmed top bangs in this hairstyle have an incredible texture, and so they look fabulous when styled into a quiff. Sides and back are skin faded to the same level as the facial hairs. In styling the quiff, some pomade is used and then the hair is styled up and slightly to the back. White hairs are a sign of aging, but they make a fantastic hairstyle if designed creatively and in most cases a quality product is all that is needed. In this particular look, the sides are slicked back with the longer top being styled up and forward. Note that this look is only possible due to the generous use of some gel. This cut is all about making the top appear pointy, and so a hold product will play a significant role here. The cut is simple as it only involves leaving a longer crown and neatly trimming the sides. After application of the hold product, the mane should be styled forward to converge at the front and then rolled up to create the pointy front. Sometimes keeping things simple creates a fantastic greaser look, and so this is a great hairstyle for men who do not like to draw too much attention but would still love to look elegant. The mane is trimmed short and uniform throughout. Some gel or pomade is then used, and the front nicely textured hairs pushed forward to cover an inch of the forehead. The slick back is one of those simple looks that have been around for many years. But, in this hairdo, it is greased up to make it look more attractive than the traditional one. Here the hair should be a uniform length, and if you have short or medium you will only need to grease it, and no cuts are necessary. It is then slicked back with a comb for a perfect finish. Curly hairs are simply perfect, and if you use some product to give them a hold and shine, they will look even more splendid. In this cut, the curly hair is maintained on the crown while the rest of the head is tapered short. After the application of some products the curls are rolled to the side and a few of them left loose on the forehead. The side parting and the connection between the tapered mane and facial hairs also make this cut look more attractive than other curly hairdos. The height at the crown of this hairstyle will make people want to have a second glance. This hair is not only extra tall at the top but also creates some nice wavy curls, and they are complemented by the nicely slicked sides. However, what makes it an amazing hairdo like all other greaser cuts designs is the use of gel or pomade. More often than not a combination of several things is what makes some cuts stand out like this style that brings together the top combover, a high fade and a nicely shaped beard. Although the hair is not too shiny, it still needs some gel to give it the hold. The longer top should be combed over or rolled to the side to create what looks like a short pompadour. You can slick your mane in many different ways, but very few will look as good as this one. What makes it look exceptionally attractive is the use of a generous amount of high-quality pomade. The mane is then given a hard side part and then slicked in three different directions. Hairs on the crown are slicked on the sides while those below it are slicked back. Spiky hairs also make a fabulous cut, and they also give a man a more modern appearance. Use a scissor to trim your hair nicely to make it spiky and then apply pomade or wax. The spiky hairs created should then be pushed back with the hands and not a comb so that they can still maintaining an attractive and slightly messy look. This haircut is for men who have thick, voluminous hairs and want an elegant look that they can wear every day. It involves tapering the sides or scissor trimming them to a low level and leaving the thick, voluminous locks on the top. They should then be gelled and rolled up to give them the right height. The curly roll is gorgeous, and so it is a good idea to have a clean shaved face so that all the attention can remain on your perfect hairdo. Curly hair will look best for this cut, but you can wear it with almost any type of hair provided you do it well and use some quality hair products. Modern men like to keep longer crowns and shorter sides, and so this style will look trendier as it conforms to it. The longer wavy top should be styled up to give it a firmer look, but you will need to use a lot of pomade, gel or any other hold creams. If your mane is not naturally wavy, a skilled barber can give you this appearance with a pair of scissors. The curved side part looks incredible, and it is also unique since most men are used to the straight part line that flows to the crown or the back of the head. However, the creatively done curve part is not the only thing that makes this style outstanding. Both sides of the part line are neatly slicked with the top flowing to the back while the high fade lower section is slicked to the side. Keeping natural hair is a good idea and most experts will recommend it as it looks attractive and healthier. In this style apart from the use of products to make it greaser everything else is natural. The mane is given a scissor trim that leaves a messy top while the sides are made slightly shorter. A simple part line is then created on the side then the strands on the crown slightly swept to the side. This style is another great example of the magic that the scissors can create in the hands of a skilled and experienced barber or hairstylist. Here it is used to create some eye-catching short bangs that are about two inches in length. The sides and back are then shaved short with clippers but not too close like a fade. Since the bangs are short, they will not need any further styling except for the use of pomade. The rebel look is a favorite for young men and teenagers who want to pass some message across. Although this particular cut qualifies as a rebel look, it is not overdone or too fancy like in others, and if you get it right, you will stand out. The wavy bangs on the crown are gelled then styled up for some height. Sides should be shorter than the top, and all you need to do is to push them back to finish the look. This style is for men who like to keep long wavy and spiky hairs as it looks stunning with these types. The hairstyle starts with a trim to make the long or medium mane more uniform then some hair product is used. After this, the locks should be divided into a top and back section. The top should be natural, and a little bit shaggy and then front swept to cover the forehead. For finishing the sides should be pushed back using your hands or a comb if you want them to look neater. Although most of the times all the attention is on the longer crown hairs the short faded or tapered sides play a crucial role in making the haircut look fantastic. This style demonstrates this because even though the long and messy crown bangs are very attractive, the cuteness in the hairdo is brought about by the tapered sides. They also connect perfectly with the nicely trimmed and shaped facial hairs. Dark black hair is lovely and can make any haircut look splendid because the color steals away all the attention. However, the side swept fringe in this particular cut looks great as it has been nicely trimmed and given some firmness. The sides are then carefully razor shaved but still maintain a decent height that complements the fringe's appearance. The crown in this cut is styled up and back to give it the extra length, and it is what most people will notice in the hairdo. Apart from it, the hair also has some lovely texture and the front almost looks spiky. The sides and back are of the same length as the top, but they are combed to the sides and back to make them maintain a low level. Untrimmed sideburns also add to the beauty of this cut. Classic rockabilly styles are characterized by the use of an excess amount of pomade or gel to create the greaser look. 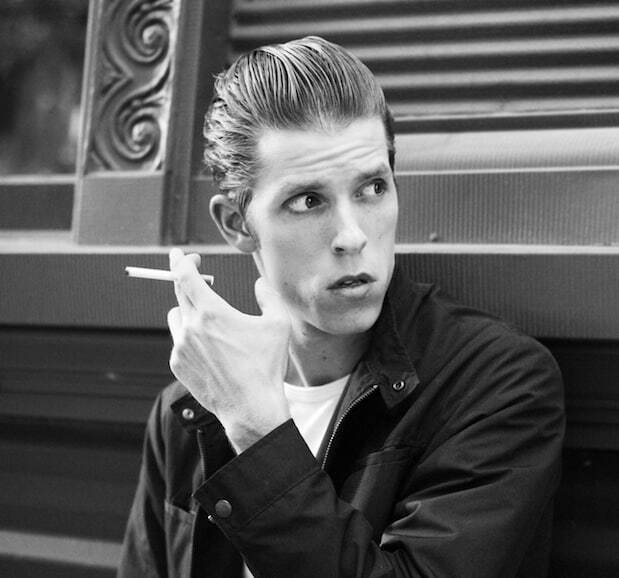 Apart from it, most rockabilly cuts like this one have the locks slicked back. However, this one adds a twist to the hairstyle with the introduction of a side part that makes it possible to slick some of the hairs on the side. Greaser hair is several decades old now and in this time, it has undergone a lot of transformation as displayed by the 51 styles above. However, despite all the changes the gel or some nice quality pomade remain the most important thing in getting the hairdo right. If you are looking for a fresh hairstyle that will give you that gentleman appeal, then you should try one of these haircuts. And the best this is that all that you will need is a good comb, pomade and most importantly some inspiration.